Since discovering that a family member needs soft foods for her diet, I am on a quest for nutritious and tasty options. I always like to have a bag of carrots on hand to make my own soups and stew. Carrot soup blenderized is what was prepared this Saturday morning by my husband. The following recipe is courtesy of “In my Kitchen”. 1. Melt butter in heavy pot over medium heat. Add the onion and the carrots and saute until onion is soft, 6-8 minutes. Add broth; cover and bring to a boil. Reduce heat, uncover and simmer until carrots are tender, about 10 minutes. 2. Puree soup smooth with an immersion blender or, working in batches, in your blender or food processor. 3. In pot, stir in orange juice, brandy and chopped tarragon. Simmer for 5 minutes more to blend flavors. Season with salt and pepper and garnish with tarragon sprigs. I’m looking at nutrition content as well as ease of eating. Orzo can be stirred into soups or added to grilled vegetables. Eat a serving of orzo, and you consume 7 g of protein. This accounts for 12.5 to 15.2 percent of the recommended daily amount. Increase your protein consumption by eating whole-grain orzo or pairing it with seafood, such as salmon, shrimp or clams, or some other meat. The protein in orzo also helps boost your energy levels. Both couscous and white rice contain small quantities of certain essential minerals. Couscous contains significantly more selenium, potassium and calcium than white rice. 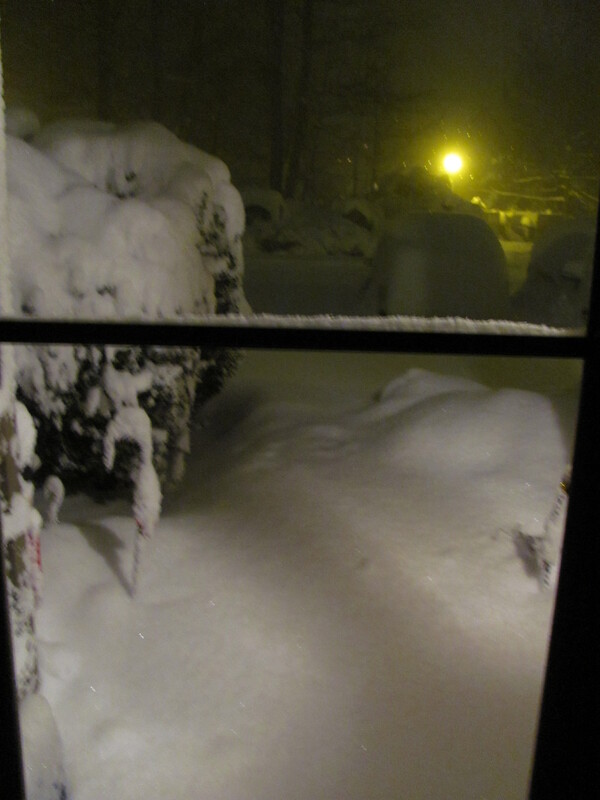 Snow- a view from the door, it's 24 degrees F and Blizzard conditions. Winter is finally upon us. This year,we have a snowstorm with Blizzard warnings beginning on the day after Christmas. We went out to church for the 10:30 am mass, and came outside to see the start of small snow flurries. I asked , perhaps we can do a little shopping for after Christmas sales, before lunch. 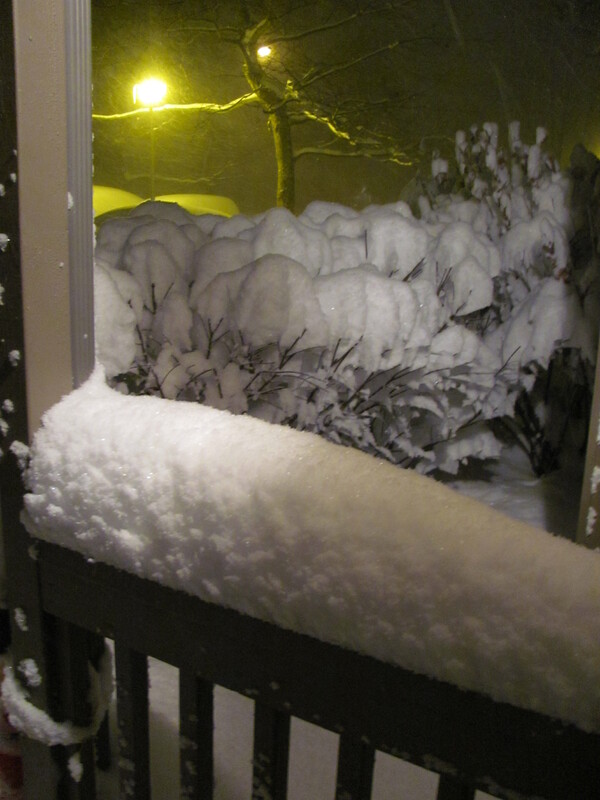 The snow is piling onto everything! See the snow in the light of the lamp! We returned home by 1:00 p.m. 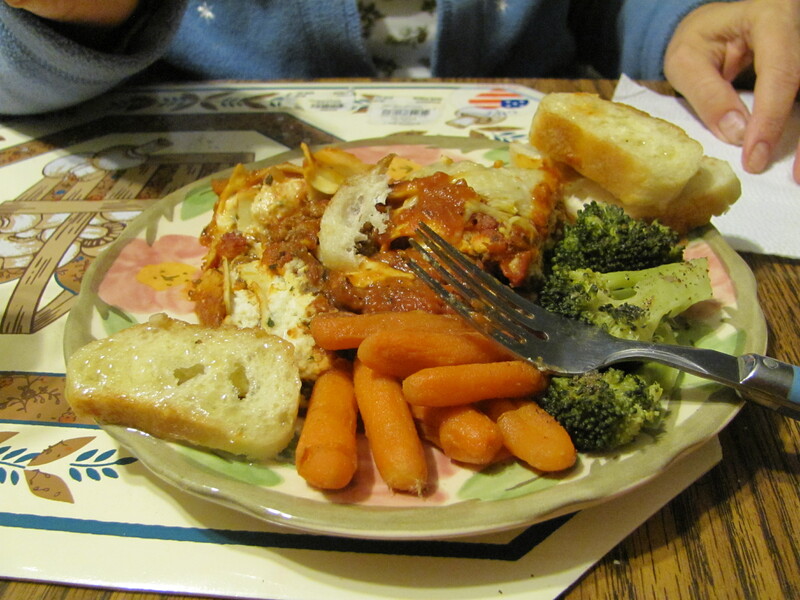 Lunch was delicious, Lasagna andbroccoli and honey glazed carrots, with iced green tea. Afterwards , we relaxed on the couch to watch some movies on the On-Demand channel. Lasagna-my sister says I make the best! 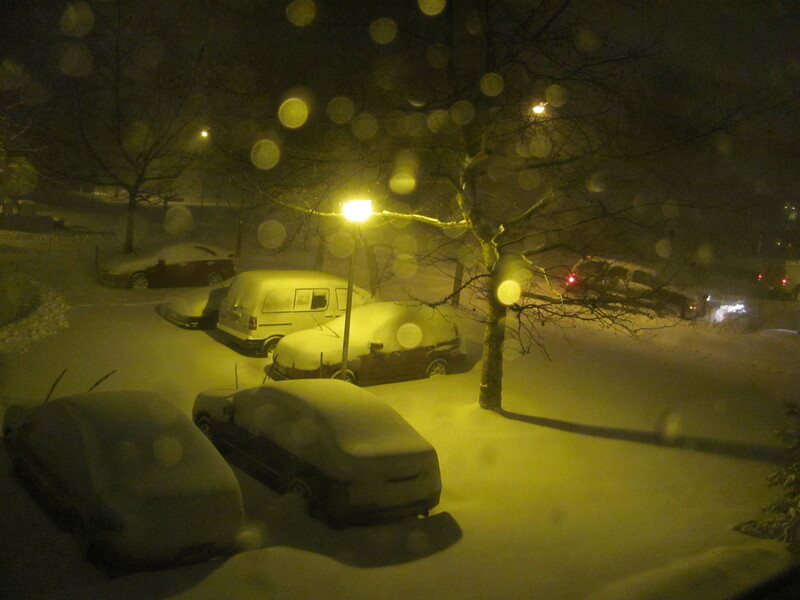 Every once in a while, I would get up to look outside the windows at the blowing and swirling snow. Judging by the increasing little pile of snow on the summer patio furniture stacked outside. Earlier this week, we had the Moon’s Eclipse on the same night as the event of Winter Solstice. Blizzard Dec. 26, 2010-the snowplow is out, we'll have to dig our cars out tomorrow! 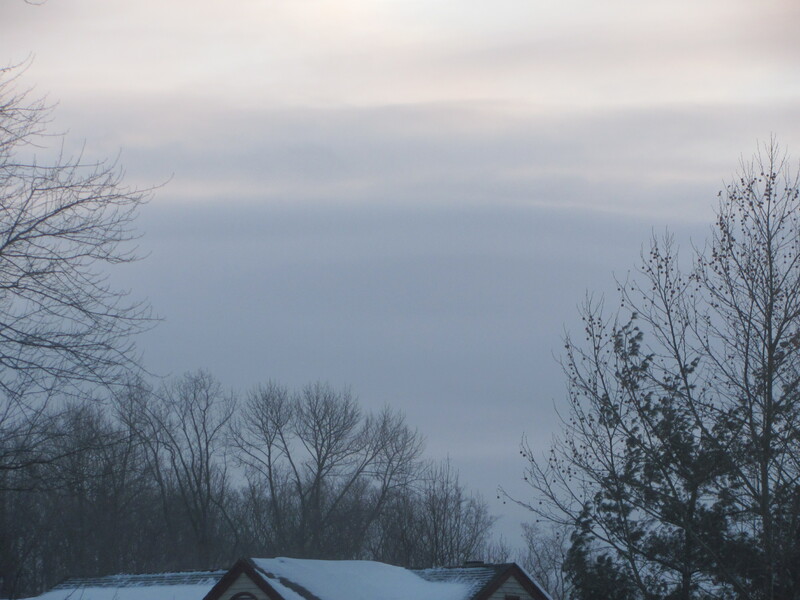 During the night, I dreamed that all of the snow blew away, and that everything was all clear. I opened my eyes, jumped out of bed to look out the window. 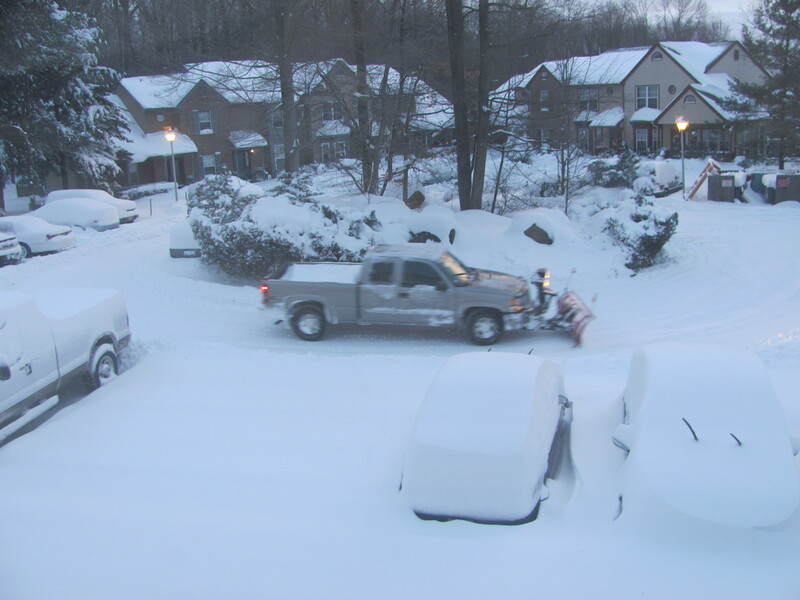 SNOW is still here, and none of the cars have left for work at 7:15 AM. A Snowplow passed by. 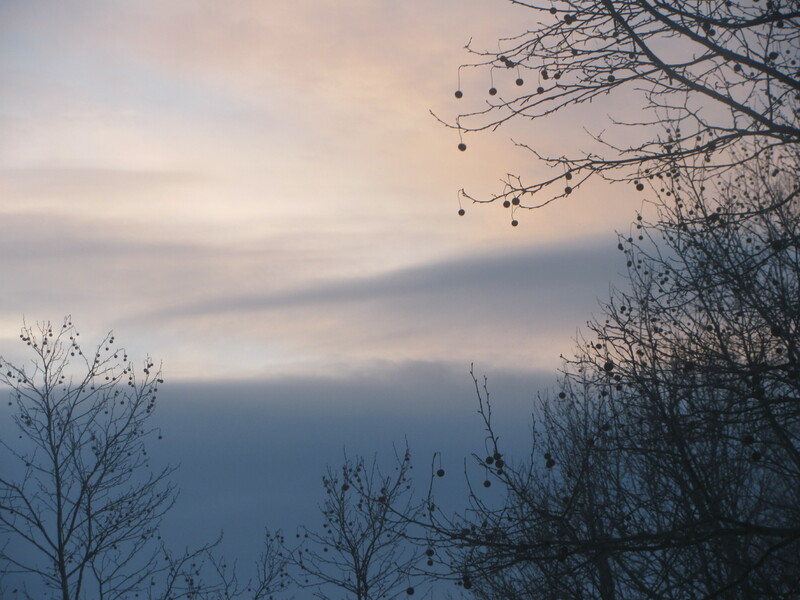 I must say, this morning, the sky just after sunrise is looking very beautiful. So silky white, almost as if there is snow capped mountains in the distance. Snowy sunrise! Morning after the blizzard!